Apple is putting the final touches on the Yerba Buena Center for the Arts in San Francisco as it gears up for the new iPhone launch on Wednesday. 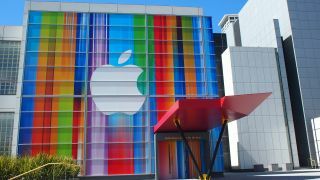 There's no mistaking that Apple is in the house, with the huge, fruit inspired logo adorning the front of the building surrounded by a vibrant Technicolor banner – which may include a hidden message. The folks over at MacRumors have taken a closer look at that banner and reckon it's made up of stretched app icons, including Games Center, iTunes, iPod, Safari and possibly Stocks logos. Now it could well be the Apple design team getting creative to produce an attractive backdrop, but of course people are looking for a deeper meaning – with the elongated icons perhaps suggesting the iPhone 5 will indeed sport that 4-inch display the whole world is talking about. Thankfully there's not long left to wait, with Tim Cook due to take centre stage on Wednesday to unveil what we all expect to be the sixth generation of iPhone. TechRadar will filling you in on all the iPhone related shenanigans as they happen, so keep it locked here for all the information on Apple's next smartphone offering. If you have your own theory behind the facia on the Yerba Buena Center then let us know in the comment box below.